Starting in Word 2016, Excel 2016, or PowerPoint 2016, you can save a file to a folder on OneDrive. In effect, saving a file this way is the same as uploading it to OneDrive. In Word, Excel, or PowerPoint, open the file on your computer that you want to save to a OneDrive folder. As shown here, the Recent Folders list shows the names of folders on OneDrive (if you recently opened folders on OneDrive). 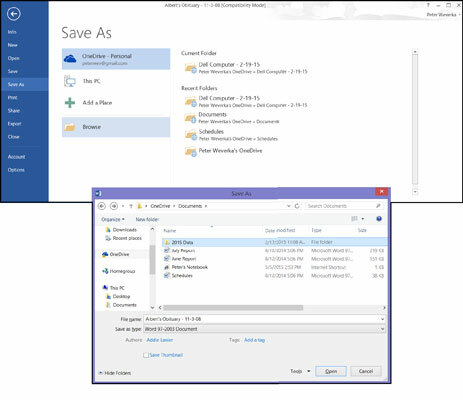 Choose OneDrive in the Save As window to save a file from your computer to a OneDrive folder. Select the OneDrive folder where you want to save the file. Select the folder from the Recent Folders list or browse for the folder. Recent folder: Click the name of the folder on the Recent Folders list. The Save As dialog box opens to the folder you selected. Click the Browse button. The Save As dialog box appears. On the left side of the dialog box, scroll to and select OneDrive. Then go to the OneDrive folder where you want to save the file. In the Save As dialog box, notice the path to the OneDrive folder where the file will be saved. You are about to save the file to a OneDrive folder on the Internet. Take a look at the Save button on the Quick Access toolbar after you save your file. It looks a little different from the conventional Save button. Those circular lines on the Save button tell you that the file is stored at OneDrive. When you click the Save button, you save your work and also refresh the file with work done by people who share the file with you. When you save an Excel, Word, or PowerPoint from your computer in a OneDrive folder, you create a second copy of the file. Be careful not to get the two copies mixed up — the one on your computer and the one at OneDrive.